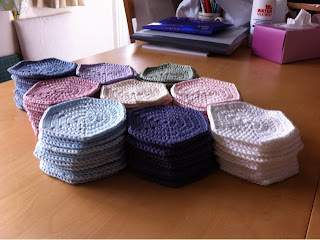 Going round in circles, crocheting as I go! 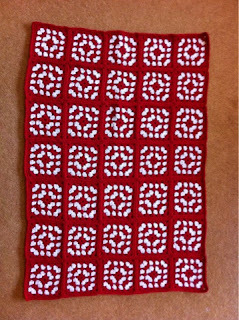 I find that one of the best ways of distracting my troublesome brain is to keep my hands busy. I've just had another two weeks of what might be called 'normal' IVs, to treat the pseudomonas that regularly upsets my lungs. These drugs won't treat the micro bacterium, so they should not be affecting the results of the samples I am sending off. Whilst I'm on them tho I do feel rather like I've been run over by a steam roller and am just knackered. This gives me far too much time to brood and worry, so I've been keeping myself busy with more crochet and also more embroidery designing with the new software and machine I've got (more on that later when I've got the hang of it!). 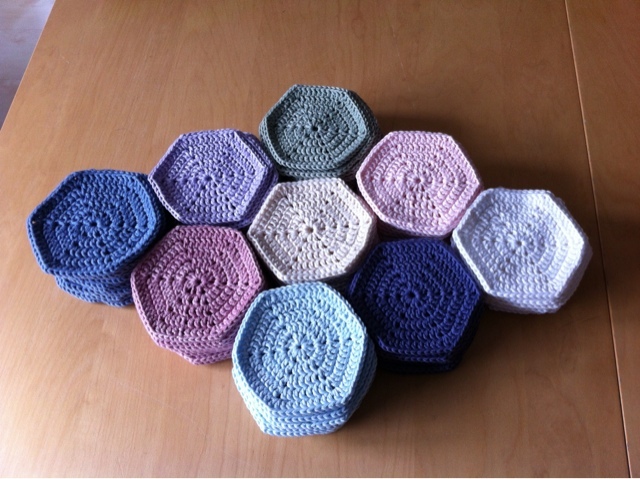 I've been gradually crocheting a blanket made of hexagons for several years now... I do a few here and then stop for a bit to do other things, then I come back and do a few more. Well this dose of IVs I decided to get it a to a point where I could stat putting it together but can can still add more hexagons on later. I've now got at least 12 of each of the nine colours and will be starting to crochet them all together with white yarn as I've worked out a layout I am happy with. Many, many hexagons to be joined together. I hate waiting. I've never been particularly patient with anything, but where my health is concerned I'm fairly useless. I like to know what is happening and what the plan is and why I am doing the treatment. So having to wait whilst the docs decide if they think I should have the treatment for the micro bacterium is just hellish. The treatment is seriously tough- three weeks in hospital on four IVs and extra nebulisers. And ts not on the cf unit because of cross infection issues. So whilst I will be in an en suite room (I'm not allowed on a ward thank God!) it won't be the super nice new ones on the unit and I will have to deal with non-cf unit staff; who with the best will in the world are not as good as the unit staff and do not have anywhere near as much experience in dealing with cf patients and our treatments. Then once all that's done it's two years of an extra two nebulisers, maybe three and an extra two possibly three pills on top of what I already take! So whilst I can totally understand and agree with the docs not wanting to inflict that on me based on not much evidence, having that hanging over me is really doing my head in... If it was just obvious that I am definitely colonised with the micro bacterium then I would say fine lets get it over with and have the treatment, which Dr Barker calls 'Domestos for the lungs'. But it's not obvious. Yes, I've had one clear positive and one sort of weak positive result but the bronchoscopy results have all been negative. Usually bronch results trump sputum because it is much more certain that the bronch samples are from within the lung and not just something I breathed in from the environment and then breathed out. My CT scans don't have any clear changes indicative of micro bacterium and I've not lost significant lung function, all of which would be suggestive that it's really there. With such small evidence its not surprising the consultants are having a hard time agreeing what to do with me! I am so annoyed with my bloody lungs! Sam, the specialist cf nurse from Papworth rang on Monday to tell me that I've grown a micro-bacterium in one of my last sputum samples....I am furious abut this! I grew a very pathetic example of one at the end of last September, it was such a tiny sample that lab could not even identify its actual species and it died on the plate before they could! However, I was immediately segregated due to cross infection risks, and had to start sending about a million more samples off and have a bronchoscopy. All the results came back negative and I was declared bug free. This was such a relief as having a micro-bacterium is really very serious, they are not easy to treat and get rid of completely and some of them are an automatic disqualifying criteria for transplant. I've got to the stage where transplant is being talked about more and I even went to see the transplant team in October to talk abut options. Fortunately the transplant team don't think I am ill enough to be fully assessed and listed for transplant yet, so I do have some time to try and get bug free so when I need a transplant it is still an option - at least that is what I am telling myself to stop outright panic.Its not that I want a transplant now by any means, it is not a cure, but I really do not want to be told I can't have one because of a stupid bacterium. 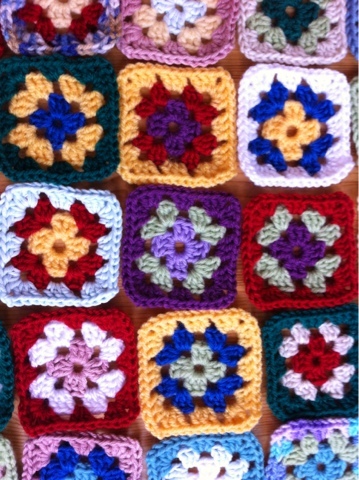 When the time comes I want to make the decision as to whether I do have a transplant myself. One of the annoying things about IVs is that you are forced to sit waiting whilst the drugs drip away. On some combination of meds you can by stuck for an hour for each drug, so you spend several hours a day attached to your drip stand (or handy light fitting!) being very bored. I hate being bored and sitting around- drives me nuts! 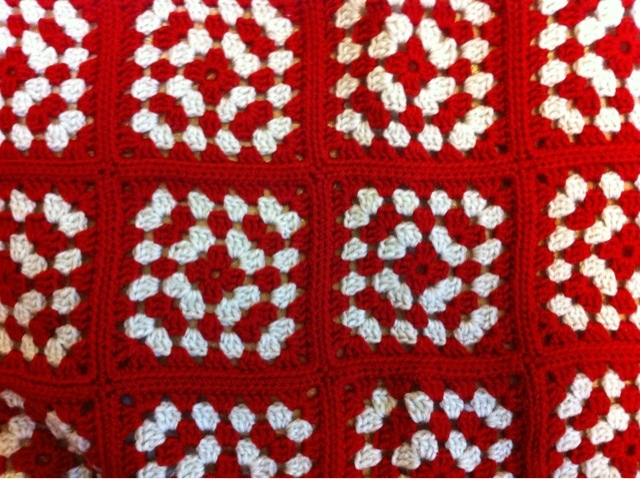 So to pass the time and do something useful I decided to do some more crochet and as I'd made a blanket for Sophie when she arrived it seemed about time nephew James got one too. 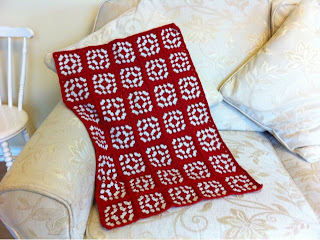 I've never been able to manage knitting, my stitches always got so tight I could never get the needles into the work! 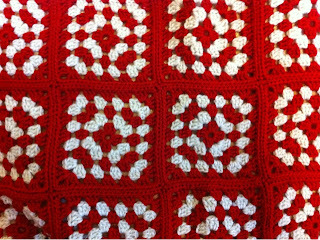 Crochet is a much better bet and I rather enjoy making lots of small motifs that then get seen together to make a blanket. 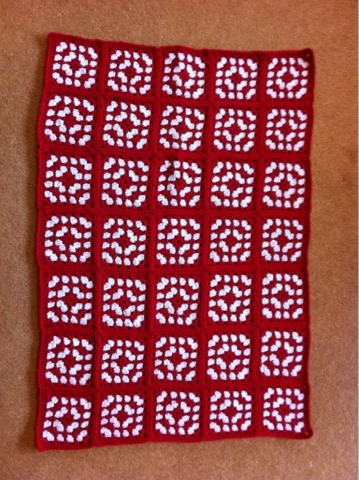 The blanket i decided to make consists of 35 granny squares in two colours. 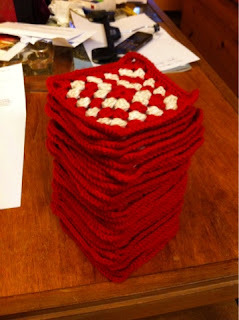 I found a really nice acrylic yarn that came in red and cream; I can't use wool yarn as i am mildly allergic to it and it makes my skin red and itchy. 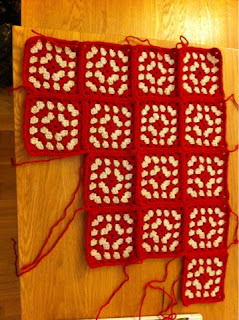 This is really annoying as most yarns contain at last a small percentage of wool so my choice of yarn is pretty limited. 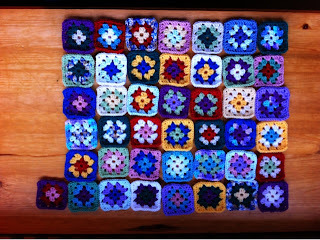 After three weeks of IVs I'd managed most of the squares and i finished the last few this week. Very large pile of squares! Blocking the first batch of squares. 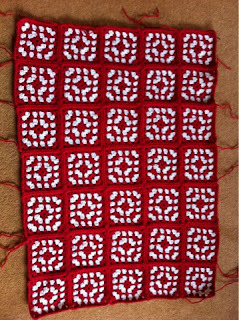 Having made the squares I then had to give them a block to get them nice and flat and even out their size. 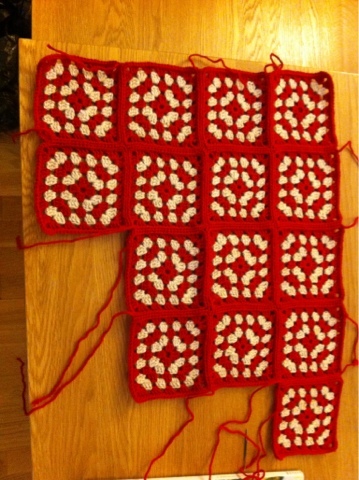 My tension is still a little bit hit and miss and some of the squares were a bit different in size. 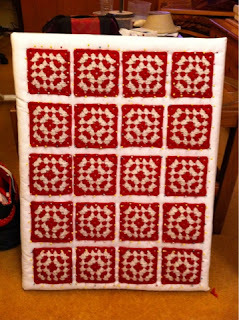 By pinning them all out onto a board and giving them a gentle steam and then letting them cool you can even out any little lumps and bumps and get each motif to be nearer in size. To join the all together I used a slip stitch in red wool to make a fairly invisible seam. 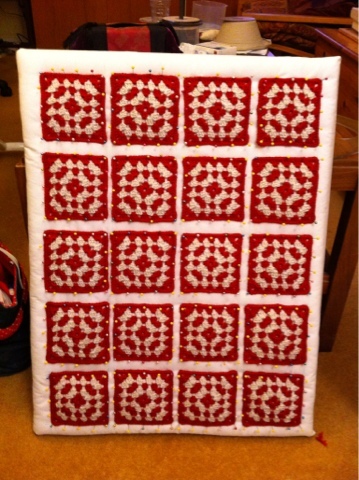 I'm really pleased with how it turned out and I hope James will like it too. 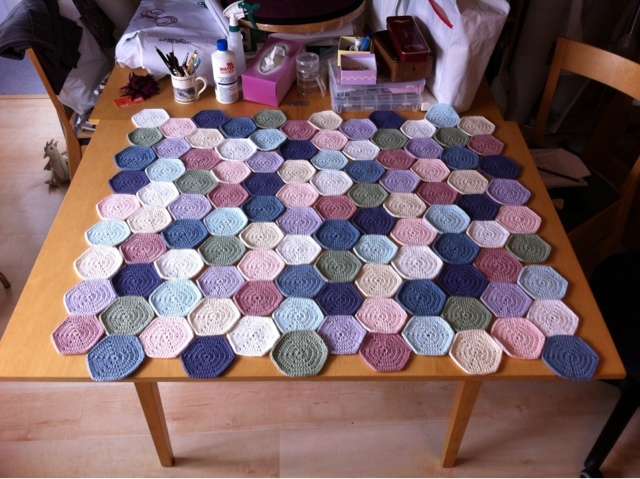 Now I have to decide what my next sedentary project will be, as sadly I think Ill be back on the IVs shortly... at least I can make something fun and useful to alleviate the boredom! 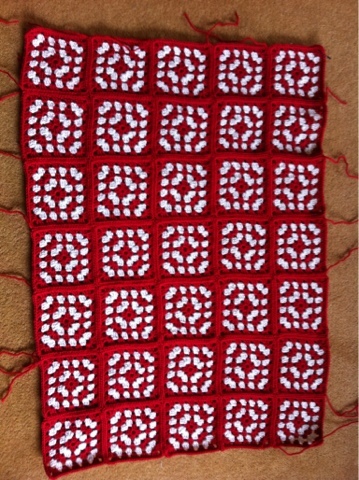 Midway through joining all the squares together. 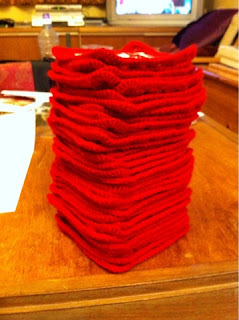 All joined together just the ends to weave in.